"Then the king will say to those bad people on his left, 'Go away from me. God has already decided that you will be punished. Go into the fire that burns forever. That fire was prepared for the devil and his angels. You must go away, because I was hungry, and you gave me nothing to eat. I was thirsty, and you gave me nothing to drink. I was alone and away from home, and you did not invite me into your home. I was without clothes, and you gave me nothing to wear. I was sick and in prison, and you did not care for me.' "Then those people will answer, 'Lord, when did we see you hungry or thirsty? When did we see you alone and away from home? Or when did we see you without clothes or sick or in prison? When did we see these things and not help you?' "Then the king will answer, 'I tell you the truth. Anything you refused to do for any of my people here, you refused to do for me.' "Then those bad people will go away. They will have punishment forever. But the good people will go and have life forever." Imagine if we viewed every person we met, especially every believer, as if he or she was the very presence of Christ! How much kinder would we be? How much more welcoming to the visitor or the desperate in our church services? How much more attentive would we be to their aches, pains, difficulties, and hardships? How much more careful would we be to not say anything insensitive or uncaring? Jesus reminds us that this is precisely the case. But he goes one step further. He also reminds us that those who are mean and cruel and hard on others will face ultimate hardship. He reminds us that the ultimate justice is not going to be seen this side of eternity. But when he comes, each will be blessed according to his or her service to him. And, of course, service to him is serving his people! Holy Father, thank you for your children of every language, nation, culture, and tribe. Help me to value them all as you do. 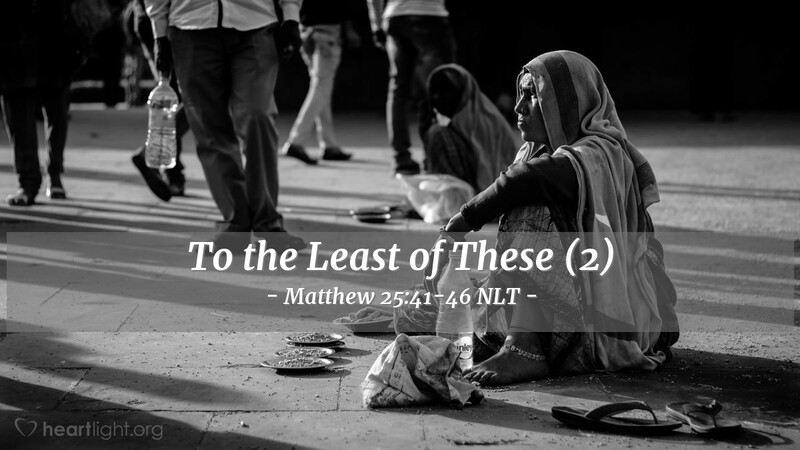 In particular, help me to see every believer as the very presence of Christ and treat them with the same dignity with which I would treat Christ. Sweep through your Church with the Holy Spirit, pouring out love in powerful ways so that we may more perfectly reflect your desire to bless and grace each other. In Jesus' precious name I pray. Amen.